I made my first party trip to Vegas three and a half years ago. After ending a relationship, my friend and I decided we needed a girls trip. (Las Vegas is the best medicine for that sort of thing). Anyway, we were on a budget and ended up coming to town during the week. Looking back, I’m embarrassed to admit that we almost didn’t go because we had some serious reservations about how many people would be in town. I mean it’s Monday through Thursday. There can’t be THAT many people at the clubs. But, I’m sure you can guess what I’m going to say next. I was utterly and unequivocally wrong. It turned out that partying at clubs on weekday nights (aka industry night Las Vegas) is now my favorite tip to share with clients. Not only were the nightclubs full of people but we were treated like club royalty. From DJ booths to complimentary bottle service, nothing beats weekday nights in Vegas (especially during the summer months). There are just so many more benefits as compared to the weekends. 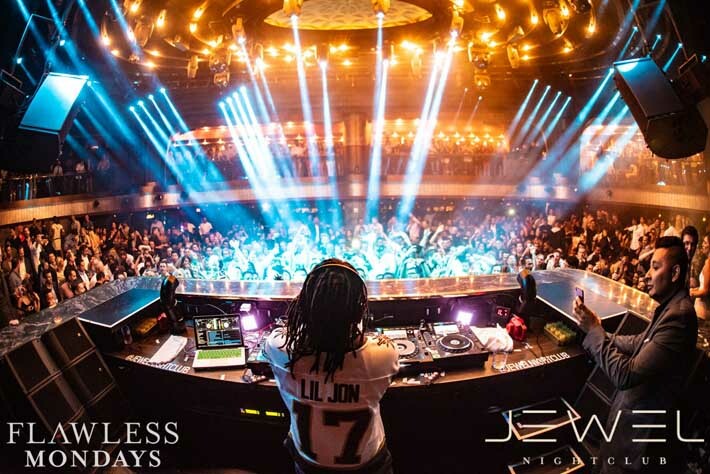 So, today I’m going to share with you everything there is to know about industry night Las Vegas and why this is one of the best times you can go to a nightclub. But first, what exactly is industry night Las Vegas? Industry night Las Vegas is a night when people who work in the clubs (also called the industry) go out and show their support for other properties. In exchange for coming out, properties reward industry personnel with free entry, complimentary bottle service, premium table locations and a fun-filled night out with their friends. Almost all clubs participate in an industry night Las Vegas, so you’ll find them going all week long. To give an example, the staff at Rehab Beach Club have a requirement to visit one competing club during the week. (This is also called an “outing.”) Let’s say that the Rehab team decides to go to XS on a Monday night. They’ll arrive at XS around 11 pm, get free entry and score a superb table location with complimentary bottles. They’ll stay most of the night, work on building relationships with the XS employees, party it up and tip the waitress upon leaving. Vegas Primer Tip: If you’re friends with a club VIP Host, you can get in on their free industry night bottle service. Just ask them if you can join their table for an industry night. You’ll need to help with the tip of course, but that should be all you’ll pay! The main reason clubs host industry nights is to say thanks to all the hosts, promoters, waitresses and bussers who send clients their way. It may seem strange to think of a club rewarding another club’s employees, but that’s precisely what they’re doing. Clubs know that bottle service clients are not going to want to party at the same nightclub night after night so establishing good relationships with other industry folks in Vegas is a great way to get business sent to their club. For example, a VIP host that works at Hakkasan might have a client that’s interested in bottle service at another club. This Hakkasan host is much more likely to send clients to a venue that rewards them with a good time and alcohol. The host will also likely get client referrals back from the competing club too if he sends clients their way. Another reason clubs host industry nights is to bring more people to the clubs. Nobody wants to party in an empty club so getting industry people there is a great way to have a lot of bodies in attendance. Industry night Las Vegas runs Monday through Thursday. It’s important to note that not all nightclubs are open on all days for industry nights, but they’re all open on at least one of the days. For example, XS is open on Monday nights but not Tuesday, Wednesday or Thursday while Omnia is open on Tuesdays but not Monday, Wednesday or Thursday. Now you may be thinking, gee sounds excellent if you’re in the industry, but unfortunately, I don’t work in it. How could an industry night Las Vegas possibly benefit me? Oh, young grasshopper, I was just getting to that. Just like industry folks reap benefits on industry night Las Vegas, so too do non-industry guests. For example, industry nights bring lower bottle service minimums, better table locations, and some of the hottest crowds in Vegas. At times, even the most in-demand DJs perform during the week too. 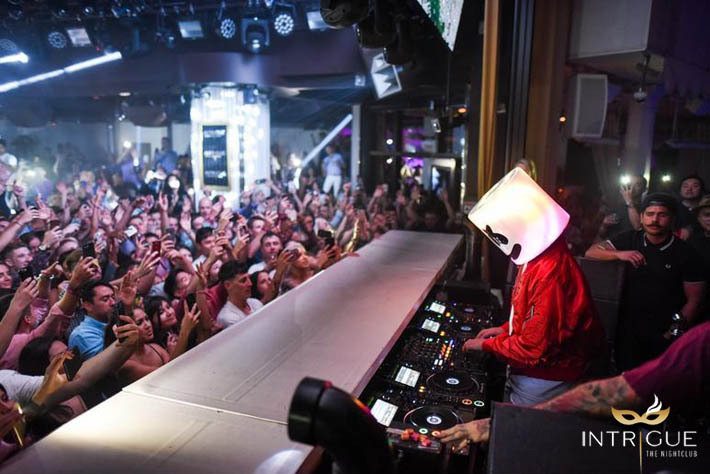 Vegas Primer Tip: You can score the best deals at clubs on industry nights in Vegas. If you want deals on bottle service, weekdays are the days to do it. From buy one get ones to low bottle service minimums, your money will go the farthest on industry nights. At times, zero minimums are even offered to returning table service clients. For bottle deals on industry night Las Vegas, text us at (702) 816-6738. You can also fill out our contact form at the bottom of this article, and we’ll get back to you promptly. And, if you’re a woman, industry nights are when comps are readily given out. A group of attractive looking females can snag free bottle service on these nights. Just be sure to include a tip for your waitress. (We recommend $100 per bottle.) Although comp tables are usually sold quickly on weekends to paying clients, you’re more likely to keep a table for an extended period or possibly the entire evening. You’ll also receive better table locations with lower minimums as compared to the weekends. From what we’ve seen, pricing on industry nights is up to 40% less than on weekends for the same table. For example, at XS nightclub, a back wall table on a weekend night might go for a $2,000 minimum whereas that same table on an industry evening is only $1,200. Okay, so the DJs may not be the absolute cream of the crop on industry nights, but you’ll still experience some of the highest rated DJs. For instance, my favorite DJ (Diplo) frequently performs at XS on Monday nights. You’ll also catch Zedd on various Tuesdays at Omnia coming up this spring and Tiesto on Thursdays at Hakkasan. There’s no shortage of a hot crowd at Vegas nightclubs, but on industry nights things turn up a notch. It might seem counter-intuitive to think that the weekdays have more attractive people than the weekends but from what we’ve seen, it’s almost always the case. This is mostly because industry folks are gracing the clubs on these nights and well, a lot of industry people are HOT. Nightclub cocktail waitresses get their jobs for a reason, and so do the VIP hosts and promoters. And, during the summer months, Vegas on a weekday is almost as packed as Vegas on the weekend. So not only will you have the local eye candy but you’ll still get to experience the beautiful people from out of town too. On industry days, the clubs are way more lenient with later arrivals. If you’re one who loves to make an entrance, showing up at midnight (and sometimes even later) isn’t a problem. And that goes for tickets, guest list, and bottle service reservations. Okay, so now that you know what industry nights are and the benefits of them it’s time to reveal the best clubs for industry nights by day of the week. Monday night is my go-to choice for industry nights. That’s because the clubs that are open on this night are some of my personal favorites – Marquee and Jewel. Guest List: Free for women and guys with an even ratio before 12 am. Text (702) 816-6738 to get on the list. Please note that guest list reservations close promptly at 7 pm. Bottle Service: prices start at $600*. For more information, text us at (702) 816-6738 or email us at info@vegasprimer.com. Ah, Marquee Mondays. Out of both clubs, Marquee focuses the most on actually throwing a party. You’ll find a different vibe here with lots of dancing and fun waitresses that actually talk with you. (Engaging waitresses are a rarity at some clubs.) At Marquee, there is zero snobbery. 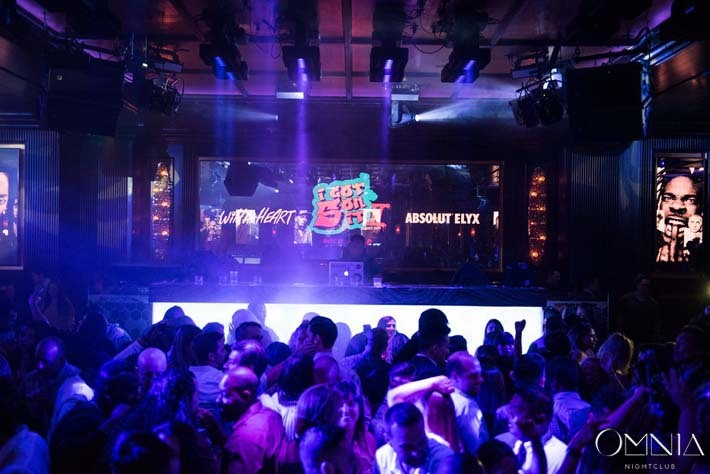 What’s more, Marquee was recently voted “Best Industry Night” by Las Vegas Weekly readers. And that award carries a lot of weight too because the people who voted are mostly locals. Another great feature about Marquee is the attention they pay their bottle service guests. They go out of their way to cater to you and make sure you’re having a good time. You’ll also have more table locations to choose from as Marquee keeps both their inside and outside spaces open for industry night. This means that there is a broader array of price points for bottle service which is excellent if you’re on a budget. But, if you want the best location, you’re still going to get it for a steal – think $2,000 for a dance floor table. The music will be a mix of everything. So, here again, everyone should be happy at least some of the time with the music. Some of Marquee’s Monday night DJs include Tritonal, Mustard, Chuckie, Vice, Ruckus and Dash Berlin. And, of course, you’ll have a good-looking crowd here too. 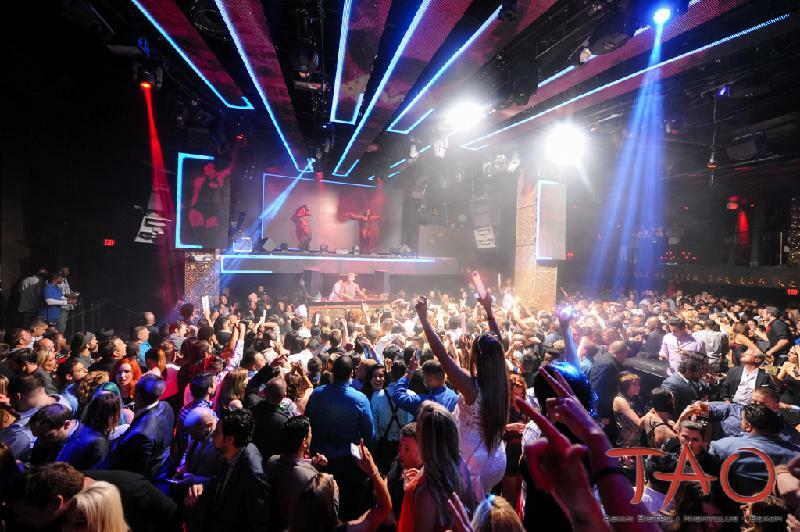 For the Ultimate Guide To Marquee Nightclub, click here. Guest List: Free for ladies and guys with an even girl to guy ratio before midnight. Bottle Service: prices start at $1,000*. For table service information at Jewel, email us at info@vegasprimer.com. Jewel Las Vegas is a new club which makes it insanely popular. And because it’s more modest-sized, you can count on Jewel being packed too. Bottle service at Jewel offers an experience unlike the other clubs in Vegas. For example, the bottle service tables are more in the action here. Other clubs have a lot of spacing between the tables and the dance floor. However, that’s not the case at Jewel. There’s almost no space between the VIP ropes and the dance floor. Personally, we think this is a good thing. You still feel like a VIP, and you get to be in the party too. Additionally, Jewel’s stage tables offer one of the best VIP experiences in Las Vegas. Although the stage tables are elevated, they’re right next to the DJ booth and dance floor. At other venues, the stage tables aren’t nearly as close to the DJ, and you’ll often feel like you’re more of a bystander than an actual party-goer. All in all, we appreciate how Jewel makes their VIP tables feel like they’re part of the action too. Jewel also has fantastic DJ talent. As the Hakkasan Group owns Jewel, you’ll see their top DJs here even on industry nights. And lastly, you’ll get a lot of attractive people coming to Jewel. Be on the lookout for the hot waitresses and hosts from Hakkasan Group’s other properties (like Hakkasan and Omnia). Many of them are in attendance on Monday nights. There are two excellent nightclub options on Tuesdays. In fact, Tuesday is one of my favorite days to go out because the party at Omnia is incredible. Omnia Bottle Service: prices start at $1,500*. 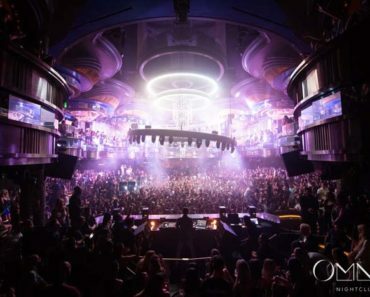 For a bottle service price quote at Omnia, please email us at info@vegasprimer.com. I’m going to be blunt. Although the Main Room is open on Tuesday nights, don’t go there. You want Omnia’s hip-hop room, Heart of Omnia (aka Heart) instead. (Heart is inside Omnia’s Main Room to the right of the main entrance.) This place is where you’ll experience the real Tuesday party. Heart is known for throwing some of the wildest parties on the strip. And as you’ll see, they’ve named their Tuesday industry night accordingly calling it “Wild at Heart.” If you want the craziest industry party of the entire week, Heart of Omnia is where you want to come. Not only that but the who’s who of the Las Vegas nightclub industry come to Heart on Tuesdays. Because of this, you’ll find gorgeous people at Heart. This club beats out every nightclub on the strip for industry night eye candy. And Heart knows it too. The venue is the self-proclaimed “hottest industry weekly party.” What’s more, if you’re looking for cocktail waitresses, you’ll find the most alluring ones here as a lot of them come for their outings. It makes sense though as the theme for Heart’s Tuesday party, “Wild at Heart” was designed with females in mind. The vibrant pink and purple colors and heart motif play to a feminine theme and attract women to the club like flies. And with hip-hop music that you can effortlessly dance to, you can see why it’s so popular. Of course, if you don’t want to hear hip-hop then you’ll want to avoid Heart altogether. Heart is exclusively a hip-hop club, so they’re only going to play hip-hop sounds. Although bottle prices start at a higher amount than the other clubs, this party is worth it. The club is packed, and you’re with the hottest people in all of Vegas. Guest List: Free for women before 1 am, guys before 11 pm. Text us at (702) 816-6738 to get on the list. Please note that guest list reservations close at 7 pm. Hyde Bottle Service: Prices start at $595*. 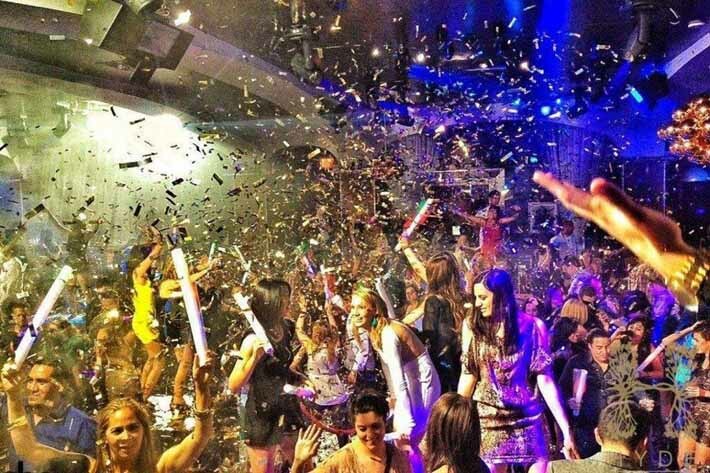 For bottle service at Hyde Nightclub, email us for a price quote at info@vegasprimer.com. If you don’t like hip-hop music, then you’ll want to come to Hyde on Tuesday nights. You’ll find Hyde has an LA vibe with a mix of top 40, techno and hip-hop. Most notable about Hyde is the bottle service presentations. Our favorite presentation is Hyde’s bottle delivery with a waitress sailing across the room in a boat. If you want to feel like a real VIP, get a presentation here because all eyes will be on you. Additionally, Hyde has the most confetti out of any club in Las Vegas. They are notorious for their confetti drops multiple times a night. (Just be sure to cover your drink. I’ve had sticky fingers too many times trying to get the paper out of my glass). A little off track here but worth mentioning. Although Tuesdays are Hyde’s industry night, the club also has industry parties on select Sundays throughout the year. These events are called XIV Sessions, and they’re legendary. They’re different from the other industry nights in that the sessions are themed parties. And they start earlier too. In fact, it’s referred to as a day-to-night party. Think 6 pm for a start time, and they go all night long. If you’re in town during one of these events, don’t miss it. Past themes include Candyland, Baewatch, and Walk The Plank (a pirate theme). As you can see below, it’s highly encouraged to dress the part. Thursday night offers up three industry night parties at 1 OAK, Light and Intrigue. Guest List: Free for ladies. Gentlemen get free entry with an even female to male ratio before midnight. Bottle Service: Prices start at $595*. For more information about 1 OAK table service, email us at info@vegasprimer.com. 1 OAK is very popular in Los Angeles and New York. Las Vegas is no different. 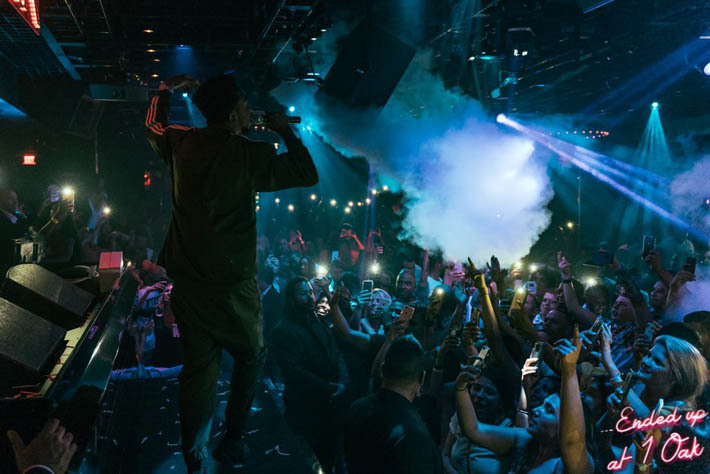 In Vegas, 1 OAK is a small, dark club that tends to attract a younger crowd. You’ll find that it’s a straight-up party in this place. The nightclub even has stripper poles scattered throughout the club. (And, yes, any female in attendance is welcome to dance on them). The DJs are lesser known, but the music is still good. Keep in mind though that you’ll only hear hip-hop at 1 OAK. So if that’s not your thing, choose a different club. On Wednesday industry nights, the club is packed with Hakkasan group employees (1 OAK is owned by Hakkasan). 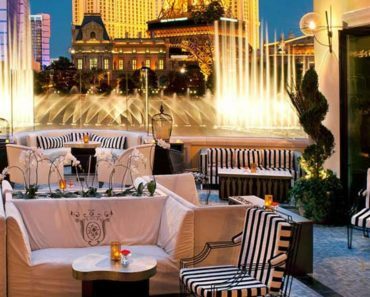 This means that the waitresses, hosts and other service staff from the Hakkasan group properties (Omnia, Hakkasan, Jewel and The Bank) will be in attendance. If you’re looking for bottle service, the best tables on an industry night Las Vegas are the stage tables which are behind the DJ booth. You’ll get the ultimate view here. Of course, you’ll want to be on the lookout for the Kardashian clan or a Scott Disick sighting. Guest List: Ladies free before 1 am. Guys free before 1 am with an even ratio of guys to girls. For guest list reservations, email us at info@vegasprimer.com. Bottle Service: Prices start at $500*. For Light Nightclub bottle service reservations, text us at (702) 816-6738. Okay, so Light isn’t the newest club in Vegas, but all that doesn’t matter because their music is some of the best in town. I’ve been to every hip-hop club in Vegas, and Light beats every nightclub for song selection. Not even Drai’s, Ling Ling or Heart play better music than Light. I’m talking every song; every mix is precisely what you want to hear. It’s incredibly fun because everyone’s dancing and singing along too. If you want one of the best club experiences you can have in Vegas, you need to come here. The club also has a cool LED screen (in fact, it’s the biggest indoor screen out of all the Vegas clubs) with crazy graphics that are choreographed to the music. And, at times, acrobats perform from the ceiling. Similar to 1 OAK, the club features stripper poles with dancers that entertain throughout the night too. Guest List: Women free until 1 am, and guys get in free with an even girl to guy ratio until midnight. Bottle Service: Prices start at $600*. Text us (702) 816-6738 for Intrigue bottle service options. Of the three clubs, Intrigue Nightclub is the newest. In fact, this club opened in 2016. And it’s in one of the most excellent hotels on the strip – the Wynn. Intrigue is a smaller club, but it has one of the best indoor/outdoor feelings around. Here you’ll party the night away with a waterfall as your backdrop. What’s even more astonishing though is the fire that lights up the water each night. You’re going to get big name talent at Intrigue too. As Intrigue is owned by Wynn, DJs are shared across their venues. For example, you’ll hear some of the same DJs here that play at XS. From Marshmello to Afrojack, Vice and RL Grime the talent is untouchable. Even the Chainsmokers perform here on occasion. A unique fact about Intrigue is that it’s the only club on the strip to serve food with a bottle service reservation. That’s right; you can order pizza from your table at Intrigue. Thursdays are the last industry day of the week, and two clubs compete for your attention on this night: Hakkasan and Tao. Now, we get asked all the time which club to go to on a Thursday, and although both are great, our vote is for Hakkasan because it’s the busiest of the two. But read on, there are exciting things about Tao too (like an open bar), so you might just have a different opinion. Guest List: Free before midnight. Bottle Service: Prices start at $1,000*. 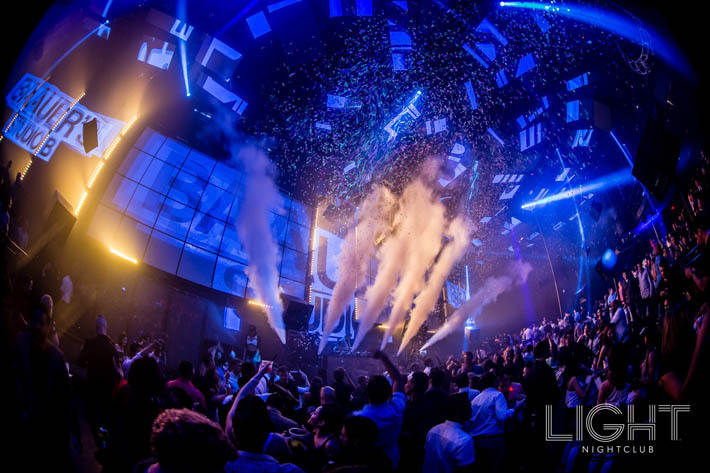 For additional information about Hakkasan bottle service, please email us at info@vegasprimer.com. Hakkasan is a relatively new club. It opened in 2013, and the club design is one of the best on the strip. With five unique floors, you can get lost in this place. On Thursdays, the Main Room is the only room that is open though. But that’s okay because the Main Room features some of the best DJ talents in the business. That’s one thing we appreciate about the Hakkasan Group. Even though it’s a weekday, you’ll still get to experience Tiesto, Steve Aoki and Lil Jon (to name a few). And, as I’m sure you can tell from the DJs I just listed, the type of music for their industry parties changes. Hakkasan switches between EDM and hip-hop depending on the day. Be sure to check Hakkasan’s schedule before you go to see who will be performing on the night you’d like to attend. Vegas Primer Tip: Eating at Hakkasan Restaurant will get you expedited and free entry into the club. There’s even a private elevator inside the restaurant with direct access to the club. Guest List: Ladies free before midnight, guys free with an even ratio of girls to guys. Open Bar: Ladies get open bar from 10:30 – 11:30 pm. Bottle Service: Prices start at $500*. Contact us at (702) 816-6738 for more details about Tao bottle service. Tao is the oldest club on our list of industry nights in Vegas and like the name implies you can expect an Asian theme in this nightclub. Although it’s more of an old club, it’s got some pretty cool features. Take, for example, the women who bathe in a bathtub naked (or seemingly so) surrounded by rose petals. Or the outside balcony that you can escape too and catch a gorgeous view of the strip. Not many people know about the balcony so look for it once you get inside the club. Expect hip-hop music with lesser-known DJs. But, the best thing about Tao is the open bar for ladies from 10:30 to 11:30 pm on Thursday nights. In fact, it’s the only club that offers an open bar on any industry night in Las Vegas. That does it for the best clubs for industry night Las Vegas! 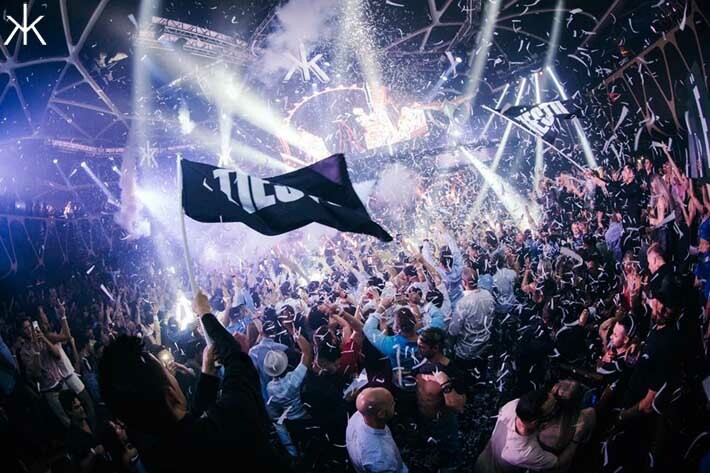 If you’ve enjoyed this post, you may also like our secrets of Las Vegas clubs, our primer on Sapphire Gentlemen’s Club or our pro tips for Calvin Harris at XS. Also, Apex Social Club recently opened and features some good pricing on bottle service tables. For questions about bottle service reservations on an industry night Las Vegas, feel free to text us at (702) 816-6738. Or, fill out the contact form below. *Bottle service prices are subject to change.